Here at Data Engineering in Hoddesdon, Hertfordshire, we have been manufacturing high quality press tools for over 40 years and have highly experienced engineers and toolmakers. 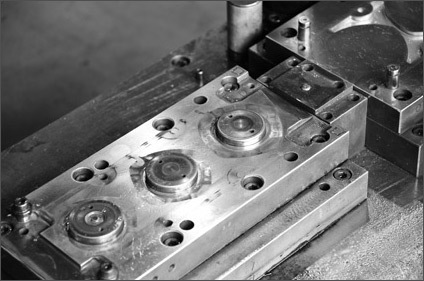 Press tooling can be used for the manufacture of many different components across a broad range of industries. Press tools are often the most efficient way to manufacture component parts and can be used for low to high volume production runs. Your press tools can provide you with many years of service providing they are the correct tool for the job and are regularly maintained. We have a wide range of knowledge of precision toolmaking including pierce and blank tools, single operation tools, progression tools and form tools. We are happy to help with the initial design stage of your press tooling and can advise on any issues which may affect manufacture. We will consider the options available to you by assessing the type of components you wish to produce, such as the material, the complexity and the volume of production, and recommend the best type of press tool for you. Often, we will produce a prototype press tool and use this to produce prototype samples. This can be done at the early stage of a project so any potential problems with the component can be resolved quickly. This can then be used to ensure the tool and the component meet your requirements before going ahead and making the production press tool. We are happy to carry out production runs once your tool has been completed. We offer a personal and reliable service and like to work closely with our customers, to ensure we meet expectations within timescales and maintain excellent working relationships. We also offer a press tool repair and maintenance service to ensure your press tools will continue to work at their best. We are based in Hertfordshire and our office and workshop are easily accessed from the M25 or M11. We have customers across the UK and are happy to come and see you to discuss your requirements.